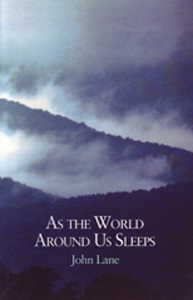 John Lane’s first book of poems, first published by Briarpatch Press in 1992. This reprint has a new cover by Mark Olencki. John Lane enjoys a varied career as writer: poet, screenwriter, essayist, short story writer and editor. But the Spartanburg resident is, first and foremost, a serious writer of poetry. A new collection by Lane is reason to celebrate… a volume of poetic sensitivity and imagination that gets high marks. John Lane may be the best argument against Thomas Wolfe’s edict— “you can’t go home again”— to come along in the second half of this American century. And as one of the most visibly documented, well-traveled writers of the younger generation, Lane, against all odds, has returned home to “the real work,” and is doing just fine. Just read the book. Is this the voice of someone who is lost? In loss be gentle sorrow? In John Lane’s poems there is room for both praise and quiet lamenting… Lane creates images both powerful and tender… He is a rising star on the literary scene, one whose work to watch for, but most of all to read.